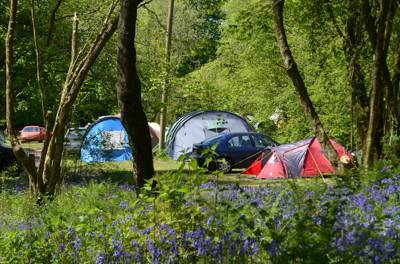 Campsites in Devon are a staple of the countryside scene. 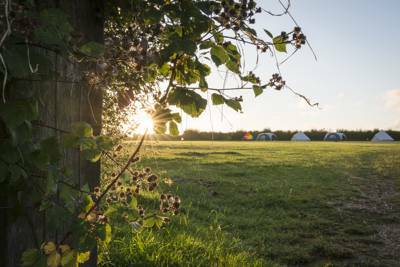 Amid rolling rolling hills and hedge-lined fields there are plenty of great camping spots to be seen. Add in the wild moors and Devon's rugged coastlines and this south-western county really does have a little bit of everything when it comes to good campsite locations. Stunning views over Croyde Bay - the beach is a stone's throw away. Keep your eyes on the sky; buzzards, kestrels, peregrine, falcons and barn owls are all common visitors. 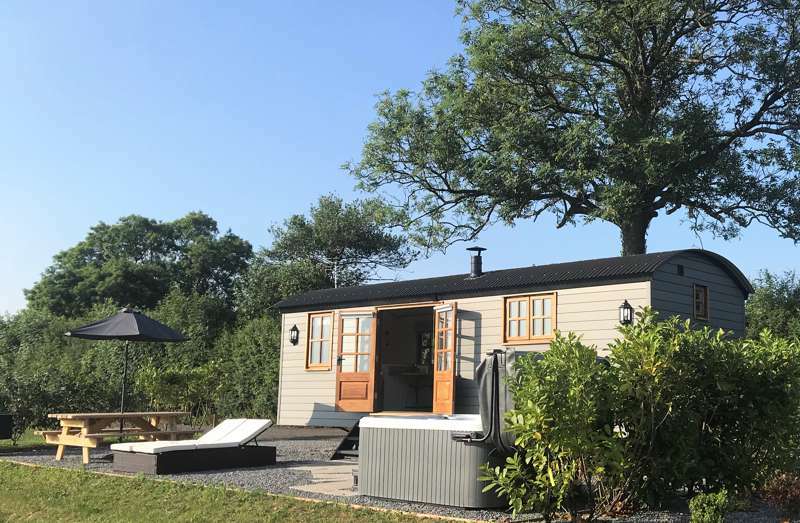 Small-scale, eco-friendly glamping on a working Devon farm, and the West Country coast nearby – boasting long sandy beaches and quaint fishing villages. 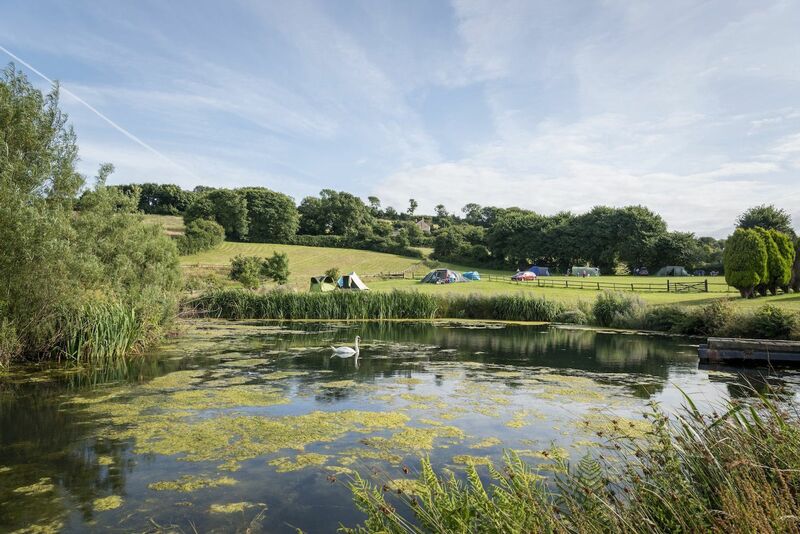 Unspoiled countryside camping on the outskirts of a working Devon farm, offering far-reaching views and a relaxed atmosphere. A secret, secluded campsite with wonderful views down to Start Bay. 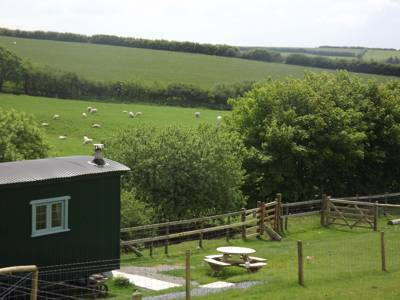 A quiet and friendly pop-up site in the heart of the Devon countryside, enjoying panoramic views towards Dartmoor. Lots of space in gorgeous surroundings plus a beach within reach, ponies to ride and campfires to build. Space for families to spread out and relax. Unpretentious camping with spectacular views and some of the best spots in North Devon within easy walking distance. Proper rural camping with plenty of space, no designated pitches and local produce on hand from the working eco-farm. At the south-western end of Torbay, the sand and shingle bay known as the English Riviera, the old fishing village of Brixham is one of Devon's real treasures. There are heaps of good Brixham campsites in the local area, the best of which make the Cool Camping shortlist. Busy with surfers and home to one of the most popular beaches in North Devon, the seaside town of Croyde is a vibrant and convenient base right on some of the finest coast in Devon. Find the best Croyde campsites with this choice collection from Cool Camping. A designated area of outstanding natural beauty, Dartmouth is an impressive place to arrive, with dramatic, wooded hills, a picturesque waterfront and a scattering of colourful and historic buildings. There are heaps of good Dartmouth campsites in the local area and, as always, we've been out on the road checking them out to bring you the very best. Dawlish in Devon is better known for its easterly neighbour, Dawlish Warren, generally considered a part of the same town and the archetypal seaside resort. There are numerous campsites near Dawlish, letting campers make the most of the town and Blue Flag Beach, but only the best make the but for Cool Camping. The busy Devon city of Exeter isn't known for its campsites – the 12th century cathedral, the Exeter Guildhall and the city-centre buzz has a far more urban appeal – but the surrounding countryside is awash with good places to pitch if you want to spend a day or two in town. At the mouth of the River Exe in South Devon, not from Exeter city, this vibrant, waterside town makes the most of a location where river meets sea. There are loads of great campsites in the local area and, as always, we've been out on the road to bring you the very best. With most of the land around Mortehoe owned by the National Trust – who describe it as "a wild, remote coast with a rich history of wrecking and smuggling" – the cliff-top village of Mortehoe in North Devon is a camper's delight. The local area is dotted with excellent campsites, too, and, as always, we've been out in tent and campervan checking them out. There are plenty of Paignton campsites within range of the town and the main attractions – Paignton Zoo, Goodrington Sands, Broadsands Beach and Paignton Pier. As always, only the best make it onto the Cool Camping list. Whether it's rambling in Dartmoor National Park, exploring the riversides of the Tamar Valley or kicking back on the beaches of the South Devon coast, there is plenty for campers to do around Plymouth. Find the best campsites in the area with this hand-picked collection. Once a thriving shipbuilding port, the harbour town of Salcombe is now one of the South Hams' biggest tourist destinations and a pleasure to visit on any camping holiday. Only the best Salcombe campsites make the cut for Cool Camping, of course. Which will you choose? Seaton and the local town of Sidmouth are often lumped together when talking about South Devon, largely because the popular section of the South West Coast path that links the two. As always, we've been out and about in tent and campervan uncovering the best Seaton sampsites, with only our favourites making it onto the Cool Camping shortlist. While Devon town of Sidmouth has a pleasant esplanade, pretty Connaught Gardens and a good museum, it's the seaside that's the main attraction. Walking the South West Coast Path between Sidmouth and Seaton is a popular place to start, basing yourself at one of Sidmouth's local campsites. Find the best of them here, with our Cool Camping collection. Known for its trio of popular beaches – Babbacombe, Oddicombe and Tore Abbey Sands – the seaside town of Torquay on Devon's English Riviera coast is a busy, family-friendly town surrounded by camping and glamping options. Only the best campsites make the cut for a Cool Camping recommendation though. No beach is more epic at low tide than Woolocombe Sands and behind it? and behind? Well, spreading beyond, the countryside is blessed with a handful of truly excellent campsites. As always, only the best make the cut for Cool Camping. Which will you choose? North Devon is home to some of the most beautiful, calm and unspoilt beaches in the UK, broken up by rocky headlands and picturesque harbour villages like Clovelly, Ilfracombe and Watermouth. It’s also a Mecca for camping. All along the coast and further back inland, the North Devon area is peppered with excellent campsites. 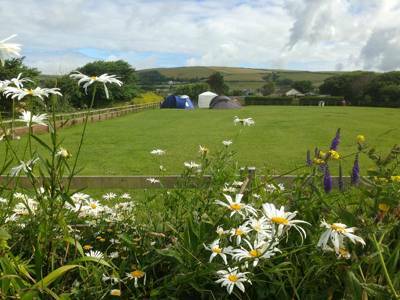 And, while there are one or two large holiday parks and big caravan sites, North Devon also places host to a whole number of independently run campsites, perfect for tents and traditional family camping. Croyde Bay and the beaches of Woolacombe, Saunton Sands and Westward Ho! 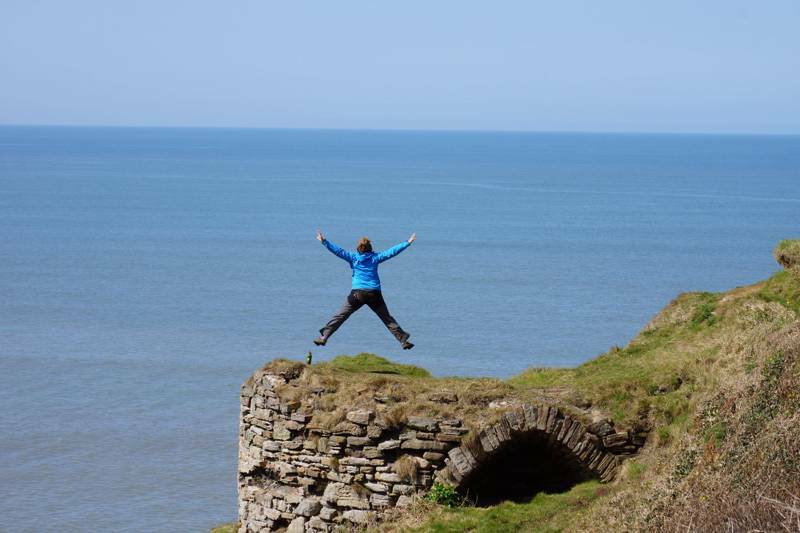 bring a lively surfer crowd every summer – expect to see boards and bikes at every campsite – while the likes of Exmoor National Park and the renowned South West Coast trail also attracts walkers in their droves. It’s families, though, that real reign supreme in North Devon. During school summer holidays the place is a hive of activity and at campsites children are quick to make new friends and rabble around in playful groups throwing frizbees, kicking balls and regaling their new found buddies with stories from their day at the beach. For campers, there are few finer spots in the UK to be. Whether it’s exploring the wondrously preserved landscape of Dartmoor National Park or hopping between the rocky coves of the South Devon coast, there’s something to please everyone here. While the north coast is home to vast sandy beaches that seem to go on for miles, it’s in South Devon that true intrigue is found, with great river estuaries, dramatic gorges, exposed headlands and hidden inlets, plus any number of smaller beaches that please in equal measure. The River Exe runs its way into Exmouth, the River Dart into Dartmouth and the Teign into Teignmouth, all creating varied valley landscapes inland, while, on the coast, the sea of the English Channel does the modelling work. In amongst this natural backdrop there are campsites of all shapes and sizes. Secret gardens have been transformed into tiny campsites, where you can pitch your tent or park up your campervan away from the crowds, while farmers have open fields during summer months to offer simple, family-sized camping patches. 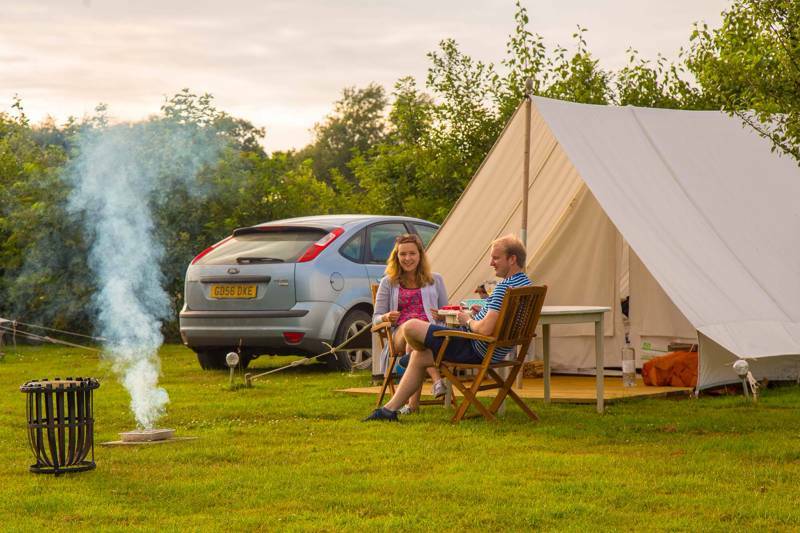 Whether your hunting for a school holiday stay at a pop-up campsite in summer, or your looking for a snug glamping getaway or a winter campervan break, there’s plenty of choice in South Devon. Browse our favourite campsites below and book your next adventure online today. Discover the best bell tent glamping in Devon with this collection of the best sites in the area, ranging from eco-friendly romantic bell tent glamping to adult-only scenic bell tent glamping. Browse Cool Camping’s carefully curated list of campsites in the West Country, and book your camping holiday today. From family-friendly campsites to farmland sites, romantic retreats to child-friendly camping, there’s something for you. Whether it's glamping by the beach or luxury camping inland, discover the best glamping sites in Devon – all specially selected by the experienced Cool Camping team. Read on and book your glamping holiday in an instant. Fancy camping in a pod? Explore Cool Camping’s carefully curated list of the best pod camping in Devon and book today at the best price. Whether it’s a family-friendly pod, a waterside pod or a woodland pod you’re looking for, we’ve got the glamping pod for you. Browse Cool Camping's carefully curated list of the best safari tent glamping in Devon and book your glamping holiday at the best price. Whether it’s scenic glamping, remote glamping, or glamping in a child-friendly safari tent, we’ve got a glamping site for you. 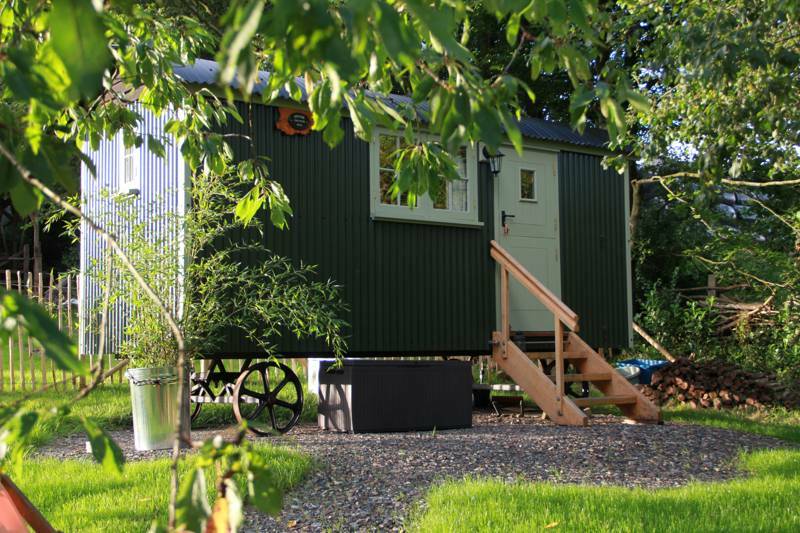 Whether it's a summer retreat by the seaside or a cosy winter bolthole, discover the very best shepherd's hut glamping holidays in Devon with this hand-picked collection of special shepherd's hut glampsites, all chosen by the travel experts at Cool Camping. From cosy shepherd's huts to fully insulated glamping pods, find the best glamping sites in Devon that are open 365 days a year, so that you can embark on the ultimate winter glamping retreat. For yurt glamping in Devon look no further than Cool Camping's selection of the best sites in the area, ranging from woodland sites to waterside yurt glamping, romantic spots to remote glamping. Read on and book your yurt glamping trip in an instant. In Devon you can pitch a tent or park up your caravan atop staggering cliffs, in lush meadows or sheltered in a pearly bay. At Cool Camping we bypass the holiday parks and pick out our favourite cooler camping spots in Devon, both inland and near the sea. So whether you fancy glamping in Devon or your simply looking for a quiet spot to pitch your tent, we're sure to have a special site to suit. Browse our collection of the best glamping and campsites in Devon below and book your next adventure online today. While surfers crowd the most popular beaches in Devon (in during winter), it’s families that really make the place their home during mid summer each year cementing the county as one of the most popular family holiday locations in the UK. It’s easy to see why, too. The good weather, the vast amount of space, the family-friendly pubs and restaurants and, of course, the camping! There are heaps of excellent family campsites in Devon, both in the north and the south, with many campsites catering specifically to families with the likes of family shower rooms, baby-changing facilities, paddling pools and more. Whether you’re a fan of coastal camping or fancy retreating inland to a hidden spot on a rural farm, there’s sure to be a family campsite to suit your needs. Browse our collection of recommended campsites in Devon below and use filters like good for kids and swimming pools to find the sort of campsite that’s right for you. Leaving the M5 and bobbling your way down the country roads of Devon, it’s not uncommon to find yourself sitting behind a motorhome or caravan. But, while the county plays host to a large number of big caravan parks and holiday centres, it’s not at the expense of smaller campsites. Local farms, in particular, continue to run traditional tent-only campsites and along the coast and in Devon’s protected areas – such as national parks and areas of outstanding natural beauty – small-scale, independently run campsites still rule the roost. So, if you’re looking for somewhere simple, rustic and tent-friendly to pitch in Devon, you’ll still find plenty of options. Just browse our collection below and use our filters to narrow down on the place that’s perfect for you. Need that extra bit of luxury? Don’t own a tent? Or simply don’t want the faff of pitching it? As well as tracking down the very best campsites in Devon, we’ve been out on the road discovering Devon’s glamping gems too, including bell tents by the beach, shepherd’s huts in the hills and family-sized safari tents for big get-togethers with all your favourite folks. And, when it comes to luxury living, Devon doesn’t fall short. There are loads of fantastic glamping options in the South West and we’re pleased to be able to recommend a hand-picked collection of the very best. You can find them all in our dedicated guide to glamping in Devon or simply use the filters below to whittle down our Devon collection to find the place that’s right for you, whether it’s a glamping pod or a cosy yurt. From boat trips to Lundy Island to cycling the renowned Tarka Trail, we take a spin around our favourite attractions in Devon, perfect for your next camping holiday in the South West. the owners are friendly, time slows down and holidays are a thoroughly laid-back affair. You can't beat pitching up in a county that has miles of beaches, some of the best weather in the UK and a tradition of good food, good pubs and good times. Whether its a seaside spot overlooking the Atlantic surf or an inland campsite tucked away down rural lanes, Devon is one of our very favourite places to go camping. 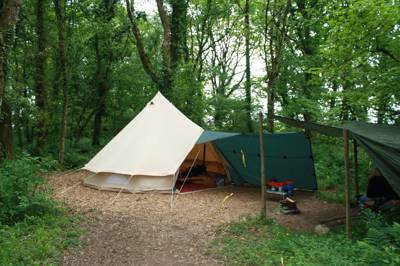 Devon, Campsites in Devon, Camping in Devon, Devon Campsites, Campsites Devon, Camping Devon, Devon Camping, Glamping sites in Devon, Glamping in Devon, Devon Glamping sites, Glamping sites Devon, Glamping Devon, Devon Glamping at Campsites in Devon, Campsites in Devon are a staple of the countryside scene and if you’re planning a camping holiday you’ve come to the right place. Whether it’s tent pitching, campervan parking or simply sleeping in luxury glamping accommodation, the experts at Cool Camping will find a campsite to suit your needs. Discover Devon campsites here and book them all instantly at the very best price.